The Work of Byron Katie can be used as a tool to challenge business assumptions. The process is described as business inquiry. “One, we could focus on the customers that have the strongest cash positions, the ones who are most likely to weather the recession. “Two, we could stop wasting time on difficult customers, the ones that keep changing their orders. They’re very high maintenance, but we keep them because we think we need them to meet our numbers. 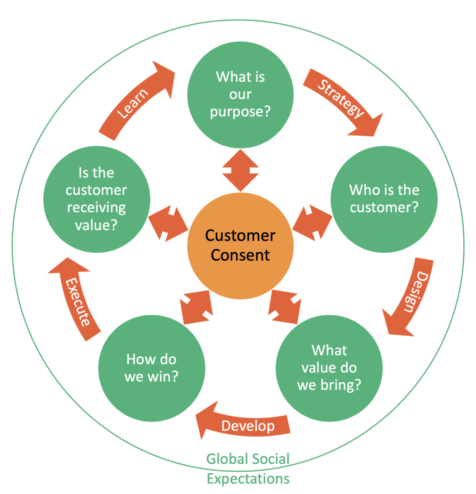 Gaurav Bhalla‘s latest company Knowledge Kinetics is all about getting your customers involved in value creation. Their “Listen, Engage, Respond” solution methodology shows you how to transform your marketing (and your company). And don’t forget to check out Gaurav Bhalla’s blog. Axel Springer: Thriving in a Dying Industry – Newspapers! While newspapers and print outfits are losing their shirts all around us, the German company Axel Springer recently reported its “highest net income since the company was founded” 62 years ago. What are they doing that our friends at the NY Times aren’t? Axel Springer generates 14 percent of its revenue online, more than most American newspapers, even though the markets in which it operates — primarily Germany and Eastern Europe — are less digitally developed than the United States. One reason, Mr. Döpfner said, is that Axel Springer has dared to compete with itself. Instead of trying to protect existing publications, it acquired or created new ones, some of which distribute the same content to different audiences. At one newsroom in Berlin, for example, journalists produce content for six publications: the national newspaper Die Welt, its Sunday edition and a tabloid version aimed at younger readers; a local paper called Berliner Morgenpost, and two Web sites. Though advertising has slumped in Germany, Axel Springer has been able to offset the shortfall by raising the price of publications like Bild, which sells more than three million copies. Now Axel Springer is looking for “undervalued assets” to buy. OK. So what are newspapers in this country going to do? Stay tuned.